While hops can be added to the boiling wort for as little as fifteen, ten, or five minutes to impart aroma and flavor, true hop-heads know the best approach to really punch up the hop profile of a beer is dry-hopping. Because hops have gone up in price over the last few years, dry-hopping your home brew is something of a luxury, and it’s especially important to make sure you do it right. Dry hopping refers to adding hops to the fermenting beer and letting them soak in it for a period of no less than 10 days. For the typical five-gallon batch of home brewed beer, one to four ounces is the appropriate range of hops to use. In dry-hopping, as with flavor and aroma hops, the strain of hops used is crucial. Since the goal is to increase the hop character, the IBU and Alpha values are much less important. For example, Amarillo imparts grape fruit notes, Centennial adds citrus, and Nugget is herbal. The key to dry-hopping (beyond picking a strain you like) is timing. The most common error in dry-hopping is adding the hops immediately to the cooled wort. DON’T! The initial fermentation period is an active one, and the hops (which will float on the surface of the beer for about a week or so) will be highly agitated as a result, with some of the pollen and other aromatics (and thus flavor & aroma) being quite literally ‘blown out’ of the beer. Waiting until the initial blow-off is complete (about 3-5 days) removes this risk. Additionally, the alcohol in the fermenting beer will strip off some of the acids and flavor from the hops, so adding the hops later (and letting them soak longer) gives a better, richer flavor. The hops are added to the beer without boiling or pasteurization first. While this may seem like an infection risk, the surface of the dried hop provides a poor environment for wild yeasts and bacteria, and infection from hops is rare enough to be inconsequential. Some home brewers place the hops in a hop sock for easier collection, but unless you intend to rack the beer after the hops have been added and continue dry-hopping, this isn’t necessary. It won’t affect the product, but it will save you a hop sock. Tips on how to fully submerse the hops are provided below. These were enough to keep 1 ounce of loose leaf hops below the surface. When primary fermentation is complete and the krausen is dissipating dry hopping can begin. In this case I did not bother to rack the beer, I just added the dry hops to the primary. First I sanitized the bag, beads, and string. Then I add the right amount of hops and beads into the bag and tied it off. Then I tied a string made of standard sewing thread around the top of the bag. I opened the cork on the carboy and pushed the bag inside, careful to keep hold of the string. When the hops were submerged, I put the cork back on, and tapped off the string. I let it sit for about ten days, then kegged. Delicious! It is also possible to dry hop in the keg. Loose leaf hops or pellets can be added directly to the keg, or weighted down in a bag similar to above. If you don’t have them in a bag expect to get hops particles floating in the beer. Some hop heads are totally fine with this. The bag also makes cleanup easier. That’s exactly how I learned – the hard way. No worries, your beer will taste dry hopped, just not as powerful if all the hops were submerged. I have heard this happens to large breweries too from time to time. I don’t see how much or what kind of hops you used for dry hopping? Unless you mean the hops added at 3 min – but that is more of late hopping, not dry hopping. Dry hopping is added during or after fermentation (usually in the secondary). Thanks, original post is fixed. Beer greetings from the Pacific Northwest! Thanks for the great information! I’ve just begun my second attempt at brewing, I really wanted to make an IPA, so I started one, but I soon realized I had no idea how to dry hop. I’m now planning on trying the hop-sock method you explained, using an oz. of each Cascade and Columbus hop pellets. It smells amazing right now, I can only imagine what dry hopping will add to it! So I am thinking about doing a 10 gal lighter ale (golden, kölsch, etc.) and splitting the batch into two 5 gal carboys. I am curious if dry hopping in one would make a noticeable difference. Any thoughts would be much appreciated. Sounds like a great idea! Light ales are usually not dry hopped, but there is no rule against it. It will be a very good type of beer to see how the flavor changes. Dry hop flavor degrades with time, so make sure to do your taste tests within a couple months of packaging. I would go with a low alpha acid hop variety that will compliment your light ale, maybe cascade or saaz? I am just trying dry hopping for the first time as well. I’ve put 2 ounces of Rainier Hops into secondary with a Marzen recipie I have going. I did put a few marbles into the hop bag, but i guess are a lot more boyant than i had thought because the bag is still kinda floating in the top of the carboy; in fact, I had a lot of foaming after I put it in. I’ll use more weight next time. I have no idea how i’m going to get it all out of the carboy, but i’ll probably rack the beer out first. Good discussion on dry hopping, thanks for the info. I had the same problem the first few times. Hops are surprisingly buoyant! 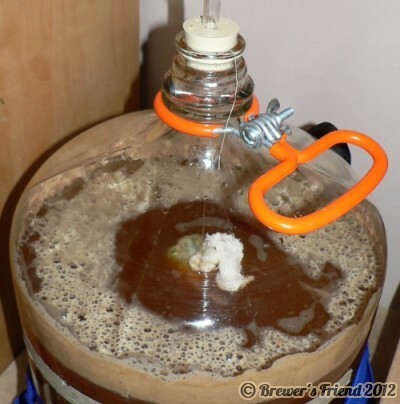 Getting everything out of the carboy can be a little messy but you shouldn’t have too much trouble. I added Rainier hops to our list too, thanks! Very helpful, the tips about dry-hopping – thanks. I’ve just done it for the second time, after 25-odd years of brewing just by wet-hopping. A good “India Pale Ale” last October, and now a simple porter which gives every indication of coming out well. More or less following the above instructions, I used about double the amount of glass beads shown in the photo to hold down some two ounces of dry hops. At first I didn’t appreciate how closely one must attach the hop bag to the weight, and with the whole affair half-immersed, had to call for assistance to hold up the string while I adjusted the knot lower. It’s a bit awkward managing the string – I use light nylon cord that seems more secure than cotton thread – and I’d like to work out an easier system with little clamps or such. Plan your system well before you get everything wet. 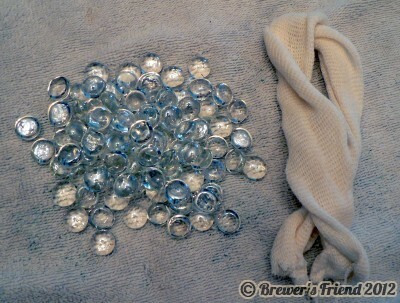 I use a plastic mesh bag for the glass beads, and cheesecloth for the hops, closing them with those plastic sawtooth closures they give you with heavy-duty plastic bags. The hops should be held loosely so as to allow circulation. This time, besides the glass beads, I tied a heavy wineglass (stemmed and sanitized) to the line to add weight for about 2 1/2 ounces of hops. Perhaps I should have harvested them a week or two earlier when they were just beginning to turn brown around the edges. I’ve tried to propagate them by just tossing the seeds in a suitable place, but with no luck – seems hop propagation is a tricky business. I’ve spotted a big stand of wild hops at another place nearby at a lower altitude, which may have more potent stuff (just like Mexico is better than Nova Scotia for certain things); maybe I’ll raid it this fall. But maybe I’ll just buy hops as usual, even if overpriced; I had fun, but it was a lot of work for four or five ounces of hops. Nice story. Yeah, hops are very buoyant, so make sure to weight them down good. You may be able to get a hops rhizomes cheaply in Italy? A rhizome is part of the root system of the hops plant. They cost under $4 here in the states, and are available March-April. I suppose you could dig up one and take it home, though it is important to know the variety of hops for recipes. It sounds like if you had seeds in the cones, you got into a male plant. The female plants do not have seeds in the cones, which is why they are planted exclusively for the brewing industry. I have read that a few male plants are added to the hops yard to help ‘stimulate’ production in the female plants. Being a “Hop-Head”, I don’t use a bag to hold the hops while their in my secondary (I just pour them into the fermenter and rack from the primary right on top of them). I use pellets and as they soak up the beer they will eventually sink. To prevent particles of hops in my beer, I tie a fine mesh bag around the bottom of my siphon and use it to prevent them from getting into my keg. I find that this is easier than trying to get a bloated bag of hops out of the top of the fermenter (that’s how I used to do it). That’s a lot of hops!!! With the string you’ll be getting every bit of flavor out of it too. Prost! I made nylon “socks” for dry hopping in a carboy. I purchased a 3 pack of nylon paint strainers (from Menard’s) and had my wife sew up some strips at 2.5″ wide by 15″ long. Be sure to sew another seam about .5″ between “socks”. I use sanitized glass marbles also to weight it down. I measure 1 oz pellet hops then pour them into the sock. I fold over the opening and seal it with a sewing needle and fishing line which is tied off or attached to a cloths pin then put the stopper back in place. The hops will expand to the size of the sock and you’ll be able to pull it out of the carboy without any problem. Excellent idea, sounds like it went smoothly. Thanks for sharing. Send me a picture and I’ll post it.